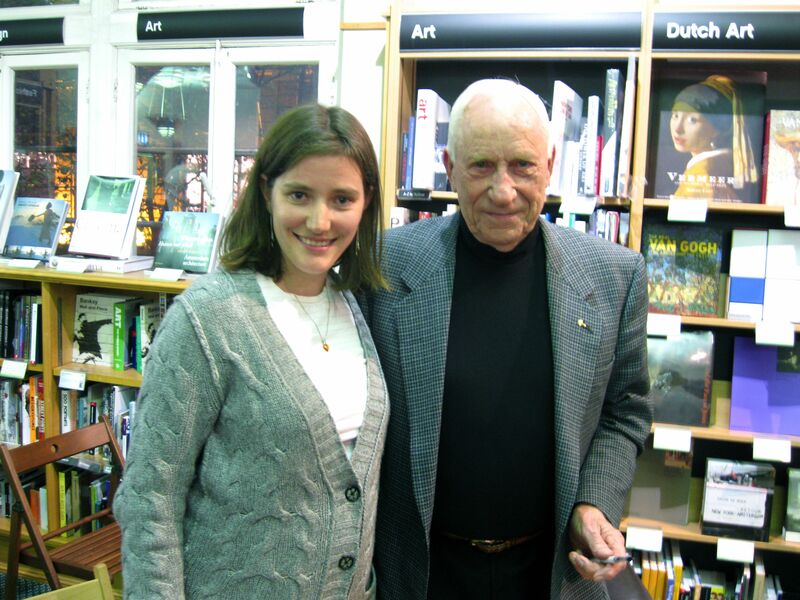 In Which I Meet Apollo 15 Astronaut Al Worden | Where is Yvette? Only 24 people have ever flown to the moon, and I met one of them in Amsterdam last week! – Apollo 15 was the first mission to head to higher latitudes on the moon 30+ degrees from the equator, and they didn’t have the gravity quite figured out for higher latitudes yet. So Worden woke up one day while they were down on the surface to see the mountain near the landing site looked above him… first thought was “we’re dead” followed by talk to Mission Control and the two on the surface coming back a little earlier than expected, turns out the command module was a mere 4 miles above the mountain. Yikes! – Apparently the three on Apollo 15 were all Air Force guys but they were backup for Apollo 12 that was all Navy, so when the two others landed to go “play army” (a term that cracked me up) Al made sure Mission Control played them the Air Force theme at one point. – At one point the other two astronauts on the moon at the time were told to go take a sleeping pill and sleep for 8 hours, they refused because work needed to be done. Later they learned the reason was James Irwin, one of the fellows, was having a seriously irregular heartbeat and wasn’t too far from having a heart attack on the moon… he later had his first major heart attack six months after the flight, had several bad ones (including quadruple bypass surgery) until finally dying of one in the 90s. As he never showed any symptoms pre-flight it’s never been figured out whether he had a preexisting condition or whether 2 weeks in outer space did it. – It turns out if you go into space your heart rate after orbit can get as low as 12 beats a minute but then increase to a normal pace, and when Worden got back to Earth his heart rate went up to 120 a few hours after. I asked what he felt the physical effects were after returning and he said he didn’t feel his heart beating hard or anything like that, but rather automatic motions like walking and picking something up were conscious decisions for some time. You just literally don’t reach far enough to grab something after being in space because you’re not compensating for gravity. – After returning to Earth (Worden piloted the whole way, one parachute burned up just before splashdown) they got into a bit of trouble for something prior astronauts had done but no one had cared about and wasn’t illegal- namely taking some postal covers and selling some to finance their kids’ future educations (astronauts at the time made ~$52k/year in today’s money). But they decided to make an example of said astronauts so he got fired from the astronaut corps and sent out to NASA Ames in California to finish his Air Force time, something he said was good in hindsight as it’s not like he was going to be an astronaut again cause all missions were booked for the next ten years. Anyway if you’re still reading this tome, after all that I got in line to get my book signed and when it was my turn Al Worden gave me a look and a no-nonsense “so what do you do?” I swear someday I’ll not be surprised by this all the time, but turns out cute young American ladies don’t usually show up in such geeky crowds making intelligent references to physics and engineering during discussions. Who’d’ve thunk? As I said, a great guy! And to conclude, this was obviously a super awesome event that I seriously enjoyed and all that. And I highly recommend you go out of your way to meet an Apollo astronaut over the next few years- they were all born in the 1930s if not earlier, and the facts of life dictate that there are only a few years more where guys like Al Worden can tell us firsthand what it’s like to explore another world. This entry was posted in Amsterdam, Science!. Bookmark the permalink. This is really cool–how awesome to meet him and to learn so much! Although I am in the same age group, I don’t see much chance to meet any astronauts. So I will settle for the next best thing: meet with YOU when you again come to Pittsburgh and hear your stories. Could be just as interesting as meeting an astronaut! Cool stuff. I saw the sign about the event the other day but then forgot. I wish I had gone along. Aw, sorry to hear you missed it! He was a cool guy for sure. Btw are you in the improv show Friday at the Crea? Very glad to hear you enjoyed the talk and signing! We oversee the content for the “Falling To Earth” Facebook page for this book, and we’ll post this blog link on there today so people can read what a fun time you had! Thank you!